All employees are set up within the Employees menu in the same manner. 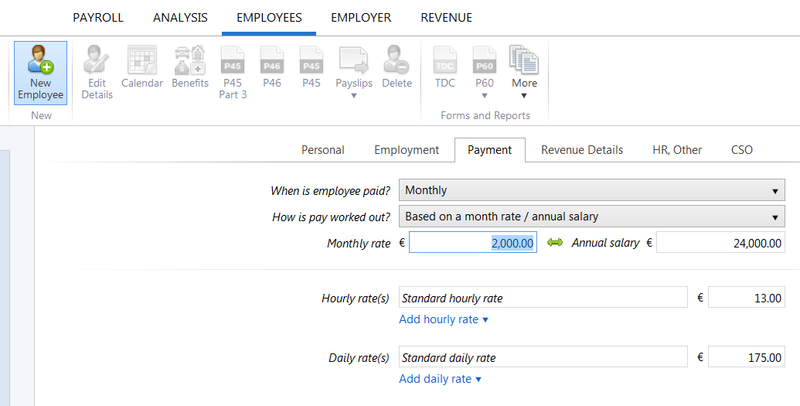 At employee level, the employee's pay frequency must be selected at the time of setting up the employee record - from this BrightPay will recognise which frequency of pay is required for the employer. In addition to the pay frequency, the employee's rate of pay to be applied to their payslip is also to be entered at this setup stage. Whilst the rate of pay for the first payslip is applied from the employee payment record, this is of course available to amend as required, before the payslip is finalised. Once the first payslip is finalised, the pay from the previous payslip is copied forward. Therefore subsequent payslips do not take the rate of pay from the employee payment record, it is taken from the previous payslip instead.